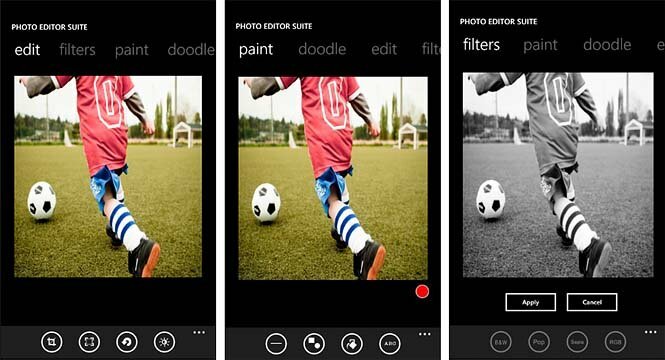 There are a handful of photo editor apps for your Windows Phone. They range from the basic to the artistic to the full editing packages. We turn our sites on Photo Editor to see how it measures up against the other options available in the Marketplace. Photo Editor has a nice selection of editing tools ranging from cropping to filters to adding clip art to your images. The interface is nice and Photo Editor does have Facebook integration to allow you to share your photos. To see how well Photo Editor hits the mark, slide on past the break. When you first launch Photo Editor, you are given the option to edit an existing photo from your photo gallery or launch the camera to capture a new photo to edit. From there your photo is sent to the editing screens. Along the top of the editing view you'll find a listing of editing processes and below are button controls for each. When you move to apply each process an Accept and Cancel button will appear to apply or reject your edits. From the three-dot menu, that runs consistent throughout the app, you can save the image, undo the last edit process, and share the image via Facebook. 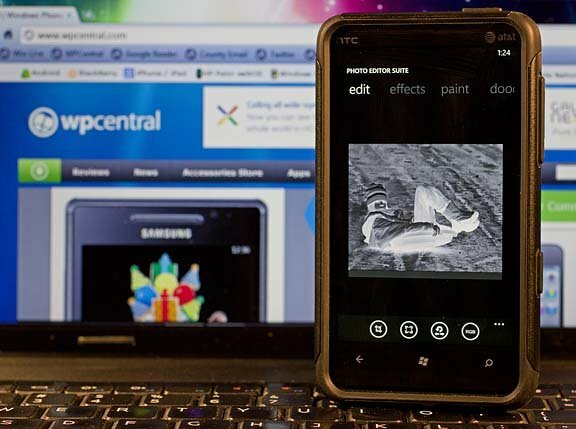 The tool set for Photo Editor falls into the mid-range of the photo editing apps for your Windows Phone. The collection of editing processes are nice but the most noticeable hang-up with Photo Editor is the interface. While the listing of the processes should be swipeable, more times than not I had to double tap each category to move around the app. In the Doodle and Paint categories, there is a colored dot just below the image where you can select the color of your text, lines or fill. I'm guessing in tapping the dot you should pull up a color palette. I'm guessing because the dot was non-responsive to the touch. The only way I could find to change the color was to use the Fill Button from the Paint Category. When you tap the Fill Button, you'll get the palette. The color palette needs to be universally available. While the tools are nice because of the difficulty in maneuvering around Photo Editor and manipulating the tools, performance was sub-par. Photo Editor has potential but as long as the interface is buggy, I'd look at CleverPhoto as an alternative. If the developers can improve the interface, things may be different. Photo Editor isn't a bad app, it just felt more like a work in progress than a finished product. There is a trial version available and the full version of Photo Editor is running $.99. I'd give the trial a shot first. You can find Photo Editor here at the Windows Phone Marketplace.